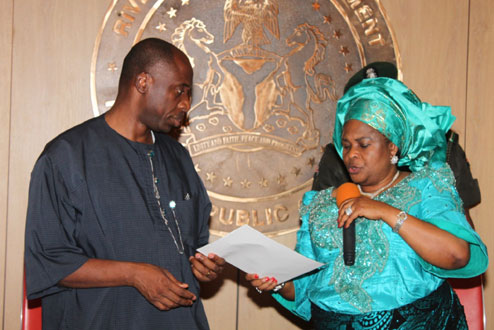 The Rivers State Governor, Mr. Rotimi Amaechi, on Sunday said his disagreement with President Goodluck Jonathan was fueled in part by the President’s wife, Dame Patience Jonathan. He said this after the premiere of a documentary on Amaechi years at the Silver Bird Galleria, Abuja. “We had a disagreement in principle between me and the President. Have you seen a country where the Commissioner of Police is reporting to the wife of the President? It’s in Rivers State. He explained that he was convinced that such conduct would not help in the development of any nation, saying he took a stand against it. Amaechi stressed that Nigeria must never again go back to such dark days, stressing that public officers should learn to lead by the rule so as to avoid abuse of office by their spouses.He pointed out that it was the husband of Mrs. Jonathan, who was elected. The governor revealed that in his own case, he ensured that his wife knew her limits and he always told her she had no right to call any of his commissioners for anything, because the people voted him into office as governor, not her. Amaechi challenged anyone, who had doubts about his performance in office, to go to Rivers State and see for himself or herself. He also said all he did in the state were not for self-glorification but to bequeath a legacy for successive administrations in the state to sustain. The governor added that 90 per cent of the people, who worked with him, betrayed him. He further showcased his achievements, spanning all sectors of the state, wondering why the Federal Government was desperate about casting his administration in bad light even when he spent N105bn doing federal roads. Amaechi pointed out that he kept a proper account of his stewardship and the books were open for all to see.This, he said, gave him the courage to sustain the struggle, expressing joy that history would vindicate him in the end.